For you My Melody addicts out there, here is a new My Melody series that you might like. ^ Personally, I don't like the design. It's nothing extraordinary. It just doesn't catch my interest. Maybe it's the color yellow they chose for the butterfly accessory on My Melody's ear. If you want to see the products, you can go here. Lately all my 2010 purchases have been off of e-bay and all of them are vintage sanrio pieces. 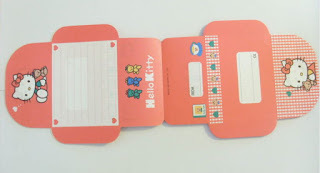 ^ This is a favorite purchase for me because I love the inside of the Hello Kitty memo fold Notes as seen above picture. I love this Hello Kitty *bear* series. This vintage Hello Kitty design, not the new design with the pink bear. I think the design with the pink bear is cute, but the design and products seem too "childish" for me. I am not sure if that's a correct term to describe my not liking the pink bear series. To me, the design is for the young generation of Sanrio fans. 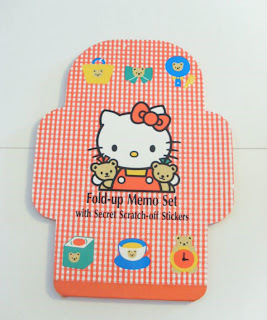 It be a perfect gift for a Sanrio kid under 12 years of age. ^ These vintage items brings back great memories, especially the pens. I love Sanrio's vintage wrist coin pouches a lot. They just have a certain appeal to having something so cute as this around my wrist, even though I'm a full grown adult and not a kid anymore. Maybe it's because I love the Keroppi *balloon* design series so much.